Kat and Karl : moooooooooose. blogger pictures = stupid. what is GOING on with the blog spot? highly annoying to someone who must have instant gratification. Most importantly, some of you did not know what the lovely game of MOOSE entailed. Above is a picture that just about captures it. Basically you stand around in a circle and drumroll......continually throughout the whole game... then someone starts - we shall call them "the pointer." They point at one person. The reciever of the point "the pointed" must do double moose antlers (as demonstrated by audra in the middle of the pic). The person to the left of "the pointed" (that would be me in this picture... i know complicated) must do a left side antler and the person to the right (sarah sweeney in this picture) must do a right-side antler to "complete the moose." 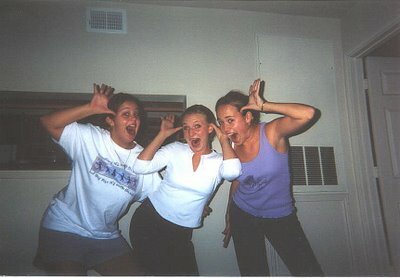 Then the person who did the double moose ears (again audra in this picture) get to point to the next double moose ear person. the point is to go as fast as you can and the person who messes up has an extra drinkey or two. the game for me originated in St. Louis, Missouri in high school (when we were only drinking soda mom!) and entertained us many nights. maybe i will take some video to give you a full demonstration at a later date. it takes a special kind of night to play MOOSE! in other news, we are so busy - my head is SPINNING! we are trying to plan a Little Rock Alum Event on Saturday, April 29th (check us out Little Rock Alum Event! Click April 29th!! so if you know any TU alums around the Arkansas area, please tell them to contact me! additionally, i pitched a website/blog combo to one of the associations we manage at the office and i am pretty sure they accepted! (clearly karl did the web work and i did the blog work! and the association will give the monies to us! hopefully... cross your fingers... i will post the finished product once the deal is DONE!) plus we have a couple other web projects.. potentially. will keep you posted on these little side projects! tomorrow we are dining w/ MK and Rea, Karl's parents, because, although we live in the same city, we haven't seen them in a LONG TIME! yikes! ok it is way past my bedtime. must stop staring at my computer for a minimum of eight hours. I must play. Teach me more! i don't remember playing that game... is that possible? out of all the drinking games i learned in college? hmm. well, next time let's do it! what did we DO before digi cameras?!?! i am pretty sure i have played moose with you before.... it is a very fuzzy memory!! i wander why! !